While choosing the next holiday destination it has now become the priority that the destination provides you with the best pictures to fill up your Instagram, or your favourite social media account. We all want others to rhapsodise over the excellent photos. The gratifications you seek from a holiday should however not be forgotten. It is not always the pictures that matter, in the end, the memories you make will last for a lifetime. Perhaps what you crave is a romantic getaway or a family getaway, to a secluded haven where the time is engrossed with your beloved person or people, and all your tensions, at the end of the vacation are drained. The Maldives has sanctuaries embedded on the turquoise water could render you with several choices. The islands of Maldives has numerous mystic islands which could help to choose on the ideal destination. Soneva Fushi is suitable as a romantic getaway destination, and it is proper for family vacations likewise. It is a beautiful, picture-perfect destination which would indeed uplift your soul with serenity. This mainly would be the perfect place to take refuge in if you are a nature lover. The journey to Soneva Fushi begins at Ibrahim Nasir International Airport at Hulhule’. There is a lounge at the Airport which the visitors use as the waiting area. The room is cosy and spacious which would help to sort out your jet lag. It also has a spa where you could enhance the tranquil. The lounge would provide you with refreshments while you take your time to relax. After relaxing, at the lounge, the hosts would guide you to the seaplane which would transfer you to the Resort. The seaplane ride usually takes around 30-40 minute. The aerial view of the Maldives is remarkably mesmerising that the journey seems to take just a short while. The plan lands a few feet away from the resort, where a speed boat will transfer the visitors. At this point, the slippers and sandals are put into bags because Soneva Fushi passionately implements “no shoes, no news” policy. According to the visitors, this has proven to be a step towards revitalising yourself throughout the vacation. The greenery of the island can be observed from the very first gaze to the island. The island is large to walk around; hence bicycles are provided to the visitors throughout their stays, for their convenience. The crystal blue sea and the pearly beaches are breathtaking. The blue hues radiated by the sea is sensual to explore when taking a walk on the beach. The resort provides non-motorised water sports facilities which would increase the fun. Soneva Fushi also offers eco-friendly surfing and takes dignity in being the first fully sustainable surfing programme. 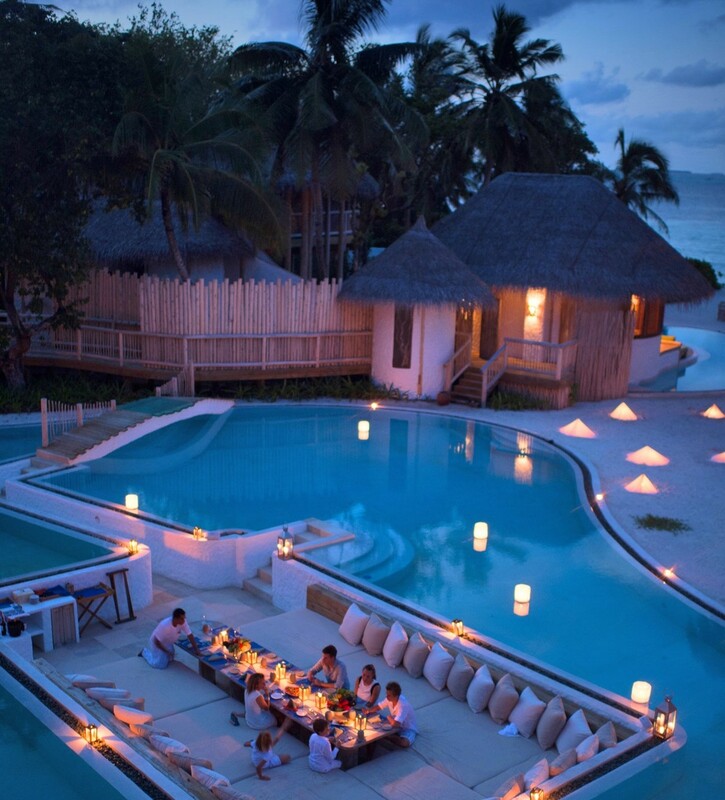 Soneva Fushi, located in Baa Atoll, has one of the richest biodiversity in the Maldives. Baa Atoll, is declared as one of the UNESCO’s Biosphere Reserve. The atoll has several coral reefs which you can explore. Hanifaru Bay, located in Baa Atoll, which is the home for a myriad of marine creatures like hawksbill sea turtles, manta rays and whale sharks are frequently sighted. So, this is one of the best dive spots and is visited by tourists annually. A nautical oasis sprawls in the Hanifaru Bay which comprises diverse species of corals and various types of fishes. Sonevafushi offers multiple packages related to diving such as Snorkel with Mata Rays and Freediving. The availability is, however, subject to seasons and weather conditions. The rustic echo-chic design architecture of the rooms and other buildings upholds the eco-friendly principles of the resort. A few years back, the villa roofs were changed from coconut thatching to wood shingles. The thatched roofs are regarded as radiating more island-vibe, but, it is less durable and thus, more wasteful. Such small details are considered in Soneva Fushi because sustainability is engraved in its core from the very beginning. 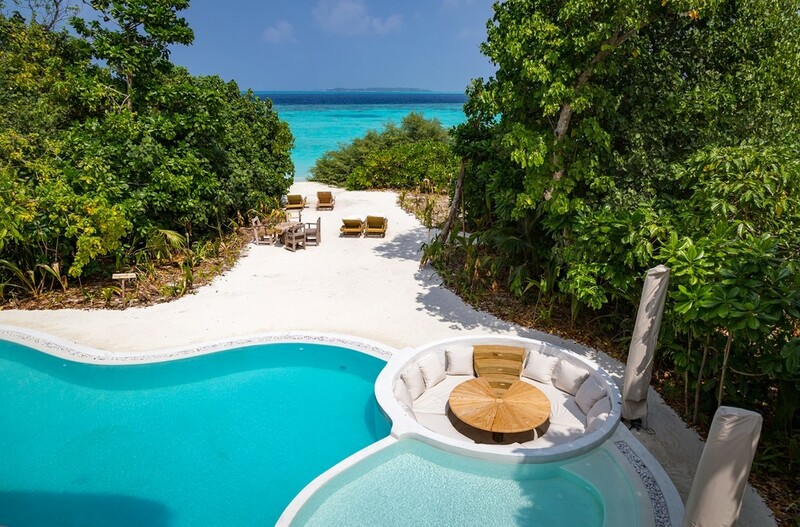 Soneva Fushi opened in 1995 by Sonu Shivdasani and Eva Shivdasani – hence, the name SONEVA coined with FUSHI, which means “island” in Dhivehi (Maldivian Language). It was the first luxury built resort in the Maldives. From the commencement, conserving the natural environment of the islands was one of the main focus of the founders rather than artificially developing the island. 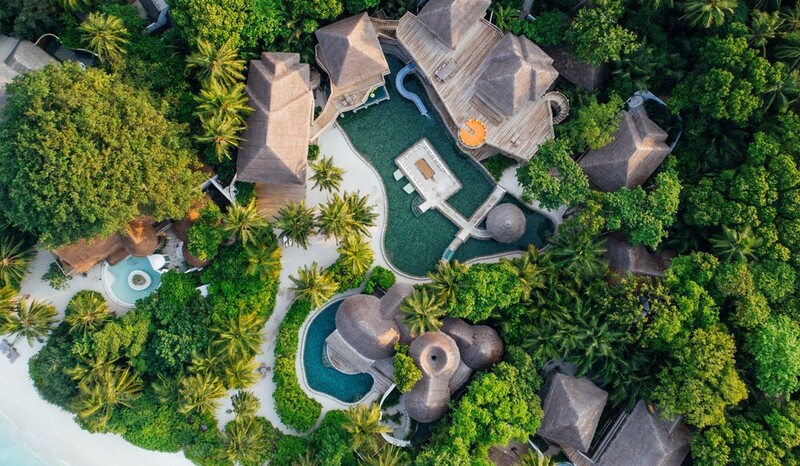 The Government of Maldives acknowledged their endeavour in sustaining the environment, and Soneva Fushi was awarded Maldives Green Resort Award in 2000. The attempts by Soneva Fushi in contributing to the cause did not cease there. They went on with pioneering activities which were not conducted out by their competitors. These activities, of course, were praised by the watchers. In 2007, Soneva Fushi took the initiative to open the waste management centre, Eco Centro. They value waste and regard it as an asset instead of trash. They create wealth by employing various recycling methods and waste reducing means. One way they started recycling is collecting metals and recycling them. They have opened Soneva Glass, where the glass wastes are obtained from the island and nearby resorts and transformed into stunning artworks. The resort then sells these artworks. Soneva Fushi founders refer to this as upcycling, because the waste bottles add more value to it than its original form. The tourists can visit and witness the scraps while being turned into art by a skilled team of artists. They even hold Glassblowing Courses for the visitors, which would expedite the visitors to produce their masterworks. This would be an exciting activity for the whole family to partake during the stay. They also use food wastes to compost their gardens. The chefs work with the gardeners to ensure that the gardens provide what they require. Thus, the organically grown food at the resort is mainly used to prepare at food at Soneva Fushi. Organic methods are employed in maintaining the gardens. The chefs, by coordinating with the suppliers further make sure that the other supplies for food preparation are organic as well. They convert the wood wastes into charcoal which are used for the barbeques. They do not burn any residue in the resort, except for in the charcoal making process. They strive to become a zero-waste resort. Soneva Fushi has also banned the use of plastic water bottles as a movement to preserve the environment in 2008. The water is now filtered and bottled in glass bottles. This movement has reduced the waste of the resort by a significant quantity. Additionally, they have even swapped the plastic amenities bottles to ceramic containers as a part of the movement undertaken to reduce the plastic usage in Soneva Fushi. They have installed the largest solar panel in the Maldives as well in 2009. 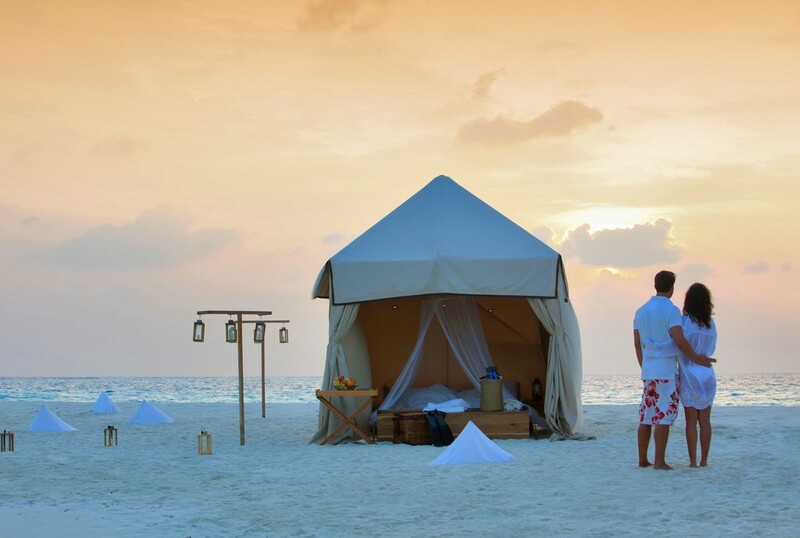 This was a significant step taken by Soneva Fushi in sustainable tourism. It reduced the island’s energy consumption by more than a half. Currently, even they are searching for options which could further increase the solar PV production. They now have a zero net carbon footprint. They aim to achieve to become a resort operating on 100% renewable energy by 2021. In 2015, Soneva founders celebrated 20 sustainable years. Throughout the 20 years, Soneva Foundation has vigorously invested in solar energy, carbon offsets and global symposiums. They conduct a meticulous auditing process, Total Impact Assessment, and publish their Sustainable Report as well. They plan to enhance their provisions and lead the way of others in developing sustainable tourism, which they believe is beneficial in the long term.